Planeswalker control has been a deck that pops up occasionally, but has always had serious issues with mana fixing and having enough strong options at Planeswalker. I've seen a lot of threads on the Walkers and just wanted to start a post on the mana fixer. This card, in conjunction with some other fixers, may be enough to put it over the top where 5 Colors walker control is playable. Fixing does not seem as invaluable to me for a superfriends style deck as ramp would, since the average CMC on your walkers probably hovers somewhere between 3 and 4. The fact that the mana has to be different color is also odd since it means you cannot help cast mono color walkers with this save for fixing to a color that maybe you don't have at all. I'm at a bit of a loss to see the combination of walkers I would want to run where this fixing is somehow more valuable than typical fetches, or even things like filter lands and Urborg. The life gain seems fully inconsequential. 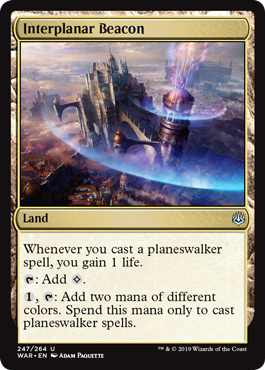 The clause forcing them to be different colors is unfortunate, but this does allow quite a bit of fixing as it produces any 2 colors (instead of just any 1 color) and doesn't hurt you on activation, like a City of Brass mana base does. The mana fixing, in my opinion, is the biggest limitor. Vintage has a lot of different ways to mana accelerate. The problem is that most of those produce colorless. I guess my point is how many decks specifically can find proper use for WUBRG mana walkers where the role of one is not filled by another similar one? This is the same issue where WOTC had trouble making more 4 color Nephelim and 4 color legends for so many years, is that once you get to 4 colors you have so much overlap that you almost don't need the 5th and sometimes you discover you didn't need the 4th. Like for instance, what 2 walkers are so synergistic that you would play them together but for the casting costs being so color restrictive to one another? I see no super prominent synergy between Arlinn and Aminatou that would make me want them both in the same list, or like if mana was so restrictive I couldn't consider Garruk Relentless over Arlinn as they have very similar roles. For all the super prominent walkers we have in the game most are blue, most don't see any play, and most are at the most 2 colors if not one. Anything with super restrictive costs has been typically dismissed because of powerlevel/not being blue to pitch, as opposed to how they can interact with other walkers. Like for instance, what 2 walkers are so synergistic that you would play them together but for the casting costs being so color restrictive to one another? It's not necessarily that there are two walkers that are ultra-synergistic and spread across 4-5 colors. I think it's more just that super friends decks are kind of "good stuff" anyway, and this land lets you more easily play stuff from farther afield. You might want to play Arlinn Kord, JTMS, Teferi, and Dack in that kind of deck just because they're all good and you're trying to benefit from the inherent power of sticking 2+ planeswalkers on the board, not because they have any particular synergy with one another. That's difficult to do just off of fetches+duals. Blue is a given need since Jace, Tezz, and all the other good walkers here (as well as needing Force of Will). Red is a given need since Dack Fayden is just too strong. White is a given need as I believe Teferi, Time Raveler is about to prove itself as good as Dack in the format. Green OR Black is a given need as I believe that Deathrite Shaman (aka the 1 mana walker) is too strong. So, yeah, already in at least 4 colors and my as well go all the way to the 5th at that point. Can you skip a color for weaker planeswalkers? I mean, I guess, but you are downgrading in power level. Aminatou, the Fateshifter + Nissa, Steward of Elements that gives you an explore every turn helping you accelerate into the game ending 6/7/8 mana planeswalkers. A lot of the things you just listed would already enable you casting 5 color walkers better than this land. I just don't see the very specific fixing of this card providing enough utility to compensate for its downsides as compared to the other options already available that would help with other cards. How do you get Dack, Tezz, Teferi and Nissa onto the board w/out fixing? A Deathright shaman off a Fetched tropical island followed by all the cards you just listed. City of brass works too. Use Dack to discard a riftstone portal. Mox Opal in some lists. There are any number of ways to get there, my point is no combination of off color walkers has yet to prove synergistic or powerful enough to merit needing to bother, and I don't see that this land somehow changes that. Deathrite off of fetch trop are the good hands already. That's only happening about 40% of the time. This card is better than City, Portal, and Opal in this style of deck. That is the point. It doesn't matter if its only a marginal improvement. This just isn't true. Getting two powerful walkers on the table is often game over. The fewer colors you play the fewer powerful walkers there are available. Every color has game ending walkers. Full stop. If you are not playing them for synergy with each other and only playing them as haymakers then once again why do you need to go into such drastically different colors. Hell, some of the most powerful walkers in the game are colorless. The reason you play Jace and Dack in the same list are because of the synergy they have with each other and the cards in your 60, not because of raw power level, and we have no issue casting them. This land does not do nearly enough to fix the mana to make me want to put something like Arlinn in that list, nor does Arlinn do enough to make me want to put her in a list with Jace and Dack. Kiroa has a bunch of synergy with Jace, yet it's not nearly enough to make me want to play her in a tight list, regardless of mana. I think you're looking at this from the opposite way Vaughbros is. You're looking at it as: Does this make planeswalkers x y and z viable to add to a list? Vaughnbros is saying, "This makes a list with planeswalkers x, y and z more viable." For the record, I'm in the middle. I agree with Vaughnbros that it does a better job of fixing for a planeswalker deck. But I dont think it does enough. Its a filter land. I think you can be better served by 2 duals that gives you flexibility in which colors you want. I feel like I'm beating a dead horse at this point, but is better than 2 duals in a number of scenarios in these decklists. Any hand without fetches to get the perfect dual. Any hand that wants to cast Nissa, Dack, and Teferi (and any other combination of 4+ colors). You are not beating a dead horse so much as not giving me a good enough reason why you would be in a situation with those 4 walkers in the same deck in the first place for this example of the cards usage to hold up. Simply put I don't think the example is realistic enough in this format to hold up as a good example. I don't think 4x of this land is strong enough fixing to make you want to play a deck with such difficult mana costs in the first place, especially not at the cost of having an otherwise colorless, non fetchable non-basic in your 60, and vice versa I don't see that the combination of those 4 walkers (or any 4 walkers) is good enough a deck list to make you play a deck with such a wonky mana base. The best example given so far in my eyes is mana crypt into beacon lets you play Teferi or Dack t1, but that seems like far too an infrequent of an occurrence to warp your deck and mana base around. I suspect the times the colorless mana screws you up or forces a mull to occur more often than it helps you cast a walker where you simply would not have been able to otherwise. I get it. You don’t think a list with 20+ walkers is good. You’ve established your opinion at this point with very little beyond that. Multiple walkers in play == Game over in most scenarios. 4-of Walkers decreases probability of multiple walkers compared to 4 unique ones. There are a limited number of uniquely good walkers. More colors gives more access to good Walkers. Then we don’t have anything to discuss. It's not that I do not agree with the premise, it's that I don't think you are characterizing it well. Multiple walkers in play is very powerful, no one doubts that. The issue is I can come up with any number of combinations of walkers right now just in the red blue color pairing that are absolutely devastating and work well together and would not need any extra mana fixing, and those do not see play right now. All 4 of these not only work well together and have synergistic abilities, but they play nice with the pieces you would want to include in your list. A deck with just these 4 walkers, Power cards, Keyvault, counters, etc would on paper be a perfectly playable list and would have a rock solid 2 color mana base that would likely be versatile enough to float a 3rd color or a full compliment of strip/wastes. But these 4 do not get played in any single list I can name, and it certainly is not for lack of mana fixing. It is because of the diminishing returns you get on having multiple walkers with a 3+ CMC in a deck in a format that is for the most part cards with much cheaper CMCs that are playable at instant speed. I don't think you can point me to some 3rd or 4th color walker that somehow makes me reevaluate this equation and go "Oh, but for lack of proper mana fixing I would play this" because I cannot think of any other walker that would be better in this shell. Typically speaking the 2nd copy of the walker that suits your deck the best is usually better than the first copy of one that is just good. One thing I noticed, DRS was mentioned as the 1 mana walker. The problem is BEACON CAN'T CAST DEATHRITE! That is a huge hurt on that point. A DRS in play mana fixes already, but a city or fetch into a dual gets you there. A beacon taps for colorless abandoning DRS to your hand. You can play any 8 of these 10 by going UWR or UBR. It's not really worth adding a 4th color for walker #9 and 10 as opposed to running 2x walkers 1-8. That's 16 walkers already. Lili, Jace, and Dack already do a great job of pitching duplicates. I guess Beacon is a fine mana fixer in a 16+ walker deck...but it doesn't let you cast ancestral, DRS, flusterstorm, plow, bolt, or any cantrip that gets you to the walker you need atm. City/Confluence/DRS/most any other manabase already gets you into easily casting 16+ great PWs without needing to run more than 3 colors or lands that don't cast anything besides PWs. Edit: If this were some kind of ancient ziggurat for PWs in addition to the 1=2 colors of PW mana, then it might be worth even more, but even that is probably not enough. This really needs to add colored mana to cast everything NOT a PW, as those cards are far more crucial to a deck working than the PWs themselves. CoB and Duals and such do that.